The index opened strong above 7000 and stayed positive throughout the entire session of trade with small dips being bought with ease and closed at 7029.75, gain of 59.15 points. The broader market though was weak with 586 advances to 926 declines. The range at the start of the series comes to 6800-7500. Call option 6900-7700 added huge 51.89 lacs OI. 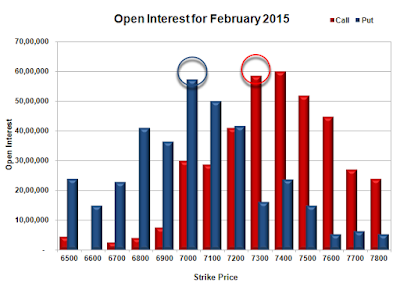 Put option 7100-6400 added huge 34.05 lacs OI with small short covering seen at 7500 and above strike prices. 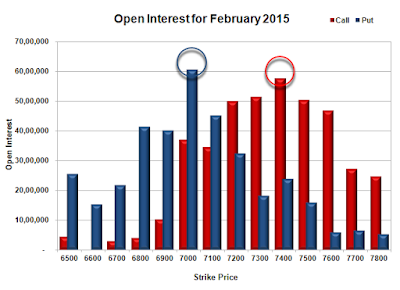 Nifty Open Interest is at 1,85,00,850 down by 1,62,150, with increase in price, most probably short covering. 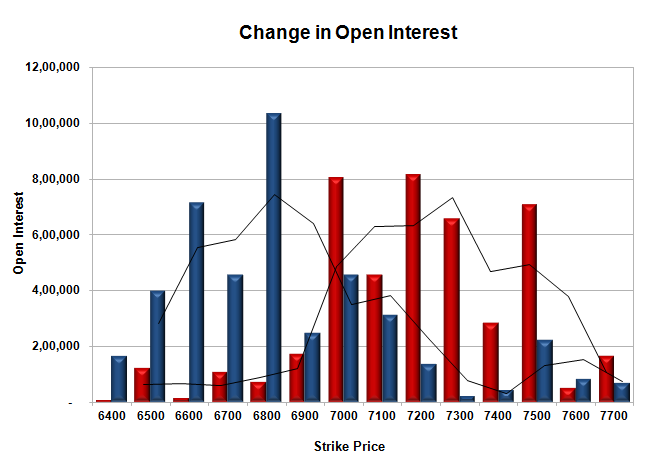 Bank Nifty Open Interest is at 21,51,060 down by 2,90,860, with increase in price, most probably huge short covering. 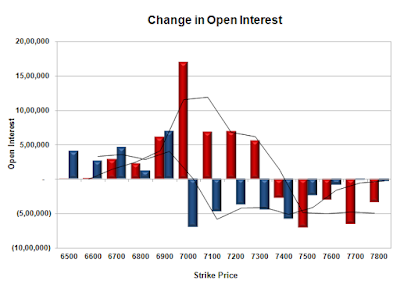 FII’s bought 3.87 lacs Futures, which includes net 8400 contracts long build-up and 7083 contracts short covering, with increase in net OI by 1317 contracts, includes 43461 longs to 27978 shorts for the day. FII’s Index future open contract as on date is 91749 Longs to 144253 Shorts, Net -51504 up by 15483 contracts. 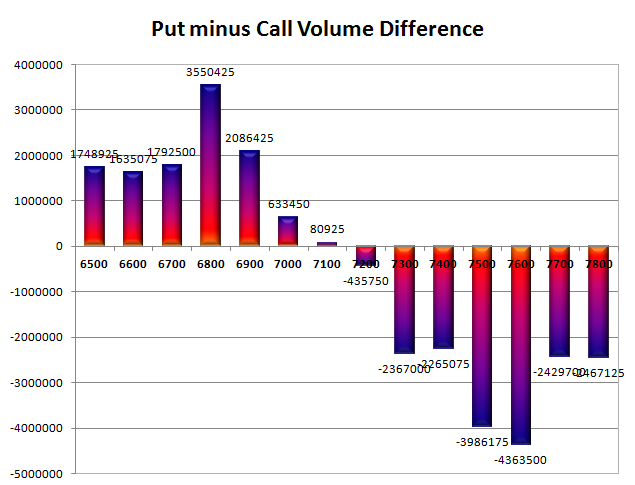 Initial and best support at 7000, with highest OI of 49.59 lacs and below that at 6800 with OI of 30.58 lacs. 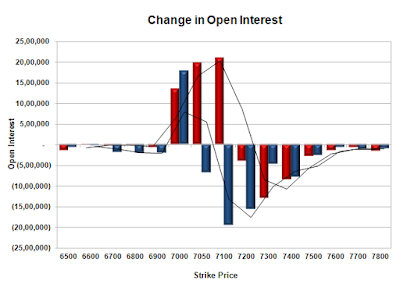 Initial resistance at 7100, with huge OI addition of 6.48 lacs and above that at 7200 with OI of 30.35 lacs. 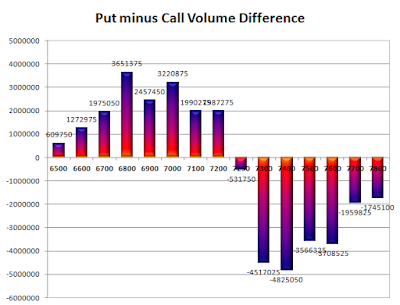 Day Range as per Option Table is 6943 - 7107 and as per VIX is 6949 - 7110 with 7023 as the Pivot. The index opened flat to positive and stayed in a narrow range but saw huge sell-off after the first few hours of trade to see expiry below 7000 at 6970.60, loss of 48.10 points. The broader market was weak with 523 advances to 994 declines. The range at the start of the series comes to 6800-7500. 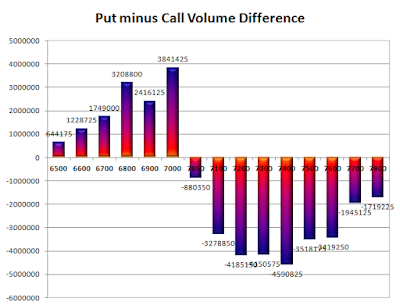 Call option 6500-7700 added huge 44.17 lacs OI. Put option 7500-6400 added huge 41.96 lacs OI. 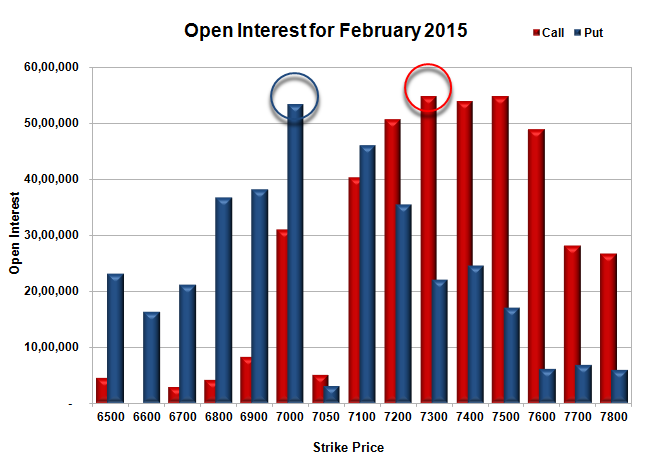 Nifty Open Interest is at 1,86,63,000 up by 44,91,150, with decrease in price, 100% roll-over with huge short build-up. Bank Nifty Open Interest is at 23,41,920 up by 5,11,080, with decrease in price, mostly roll-over with huge long liquidation. 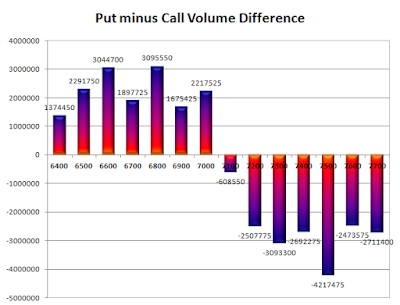 FII’s sold huge 12.61 lacs Futures, which includes net 104776 contracts long liquidation and 37750 contracts short covering, with decrease in net OI by 142526 contracts, includes 86487 longs to 136946 shorts for the day. 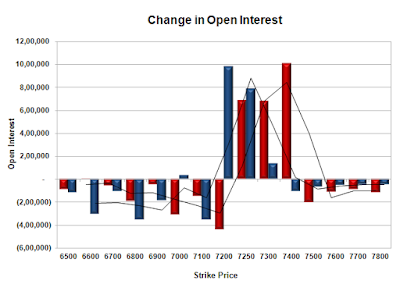 FII’s Index future open contract as on date is 84349 Longs to 151336 Shorts, Net -66987 down by 67026 contracts. Initial and best support at 7000, with highest OI of 43.66 lacs and below that at 6800 with OI of 28.64 lacs. 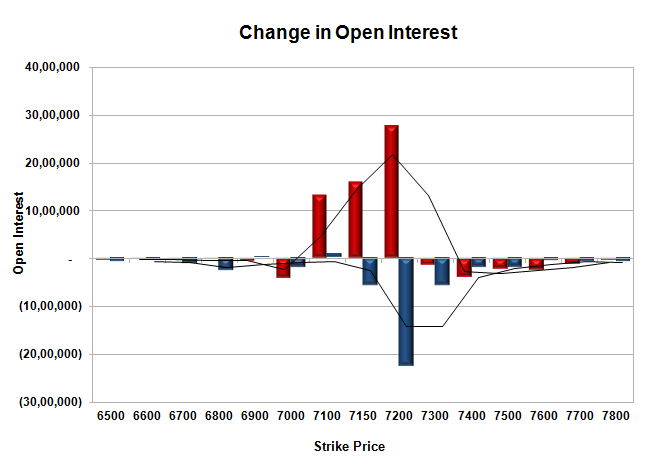 Initial resistance at 7100, with huge OI addition of 4.55 lacs and above that at 7200 with OI of 25.74 lacs. Day Range as per Option Table is 6900 - 7074 and as per VIX is 6888 - 7054 with 6989 as the Pivot. The index opened negative below 7100 and stayed weak with all small up moves being sold with ease and closed near the lows of the day at 7018.70, huge loss of 90.85 points. The broader market was weak with 415 advances to 1124 declines. The range for Expiry is at 7000-7100. Call option 7000-7100 added huge 54.33 lacs OI with profit booking seen at 7200 and above strike prices. 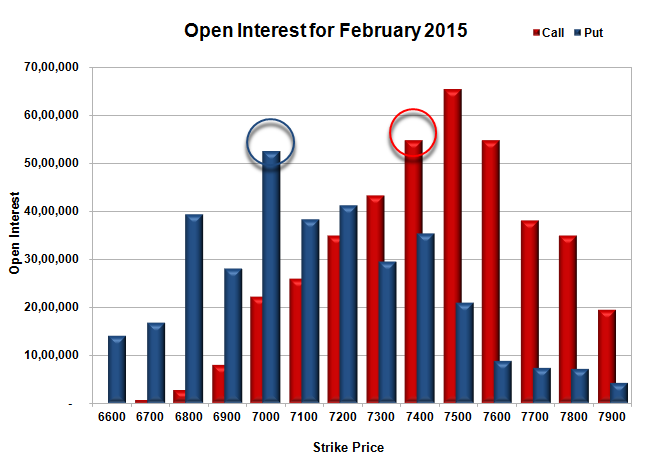 Put option 7000 added huge 17.82 lacs OI with short covering seen at 7050 and above strike prices. Nifty Open Interest is at 1,13,49,900 down by 29,80,350, whereas Mar series added 39.56 lacs with decrease in price, 100% roll-over with huge short build-up. Bank Nifty Open Interest is at 17,28,330 down by 3,65,730, whereas Mar series added 7.05 lacs with decrease in price, 100% roll-over with huge short build-up. FII’s sold 2.39 lacs Futures, which includes net 9296 contracts long build-up and 18866 contracts short build-up, with increase in net OI by 28162 contracts, includes 145164 longs to 154734 shorts for the day. 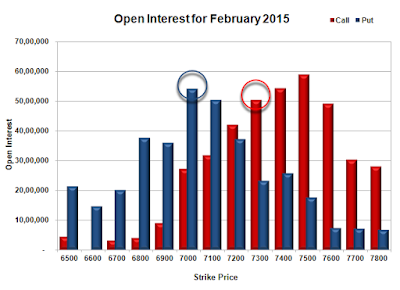 FII’s Index future open contract as on date is 189125 Longs to 189086 Shorts, Net 39 down by 9570 contracts. Initial and best support at 7000, with OI of 69.66 lacs. 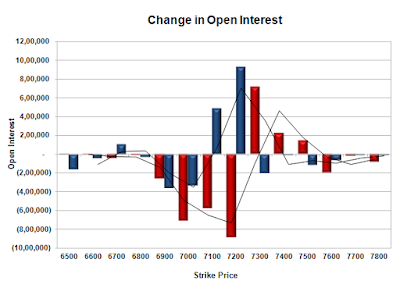 Initial resistance at 7050, with huge OI addition of 19.80 lacs and above that at 7100 with OI of 56.07 lacs. 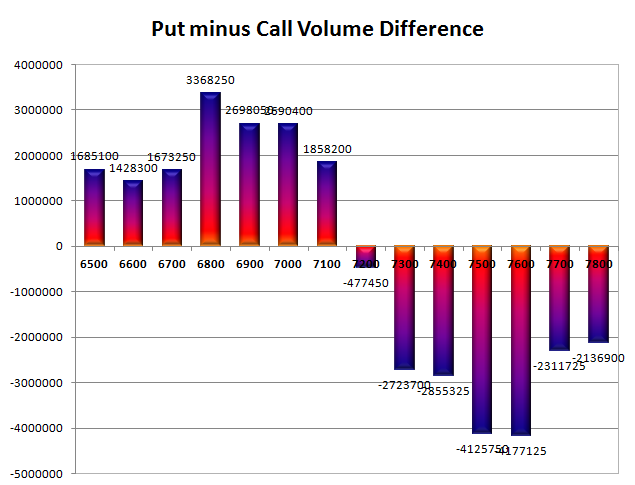 Day Range as per Option Table is 6945 - 7124 and as per VIX is 6934 - 7103 with 7040 as the Pivot. The index opened weak around 7170 and stayed in a narrow range of 7146-7227 but closed positive and above the psychological level of 7200 at 7210.75, gain of 19.00 points. The broader market was positive with 834 advances to 702 declines. The range till expiry is now at 6800-7300. 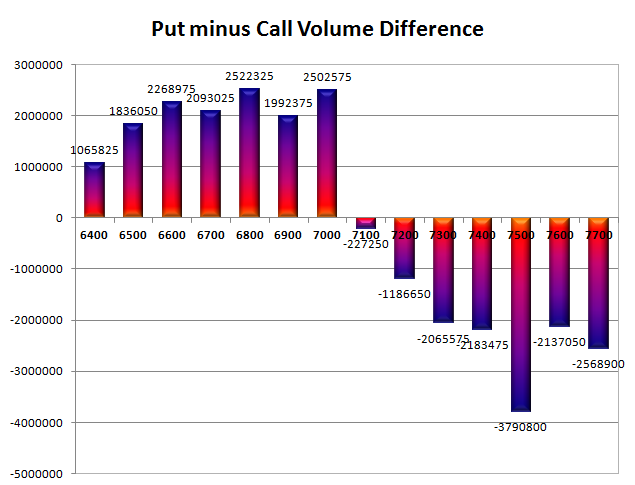 Call option 7200-7400 added 4.31 lacs OI with short covering seen at 7100 and below strike prices. Put option 7300-7200 added huge 11.40 lacs OI with profit booking seen at 7100 and below strike prices. Nifty Open Interest is at 2,05,50,225 down by 10,76,700, whereas Mar series added 7.00 lacs with increase in price, mostly roll-over with some short covering. Bank Nifty Open Interest is at 24,39,600 down by 2,01,120, whereas Mar series added 0.24 lacs with increase in price, small roll-over with huge short covering. FII’s sold 4.19 lacs Futures, which includes net 11980 contracts long liquidation and 4794 contracts short build-up, with decrease in net OI by 7186 contracts, includes 33082 longs to 49856 shorts for the day. FII’s Index future open contract as on date is 170690 Longs to 158323 Shorts, Net 12367 down by 16774 contracts. 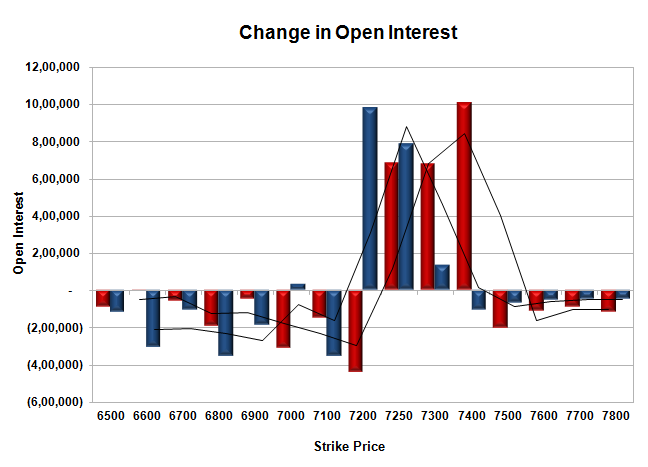 Initial support at 7100, with OI of 45.30 lacs and below that at 7000 with OI of 53.63 lacs. 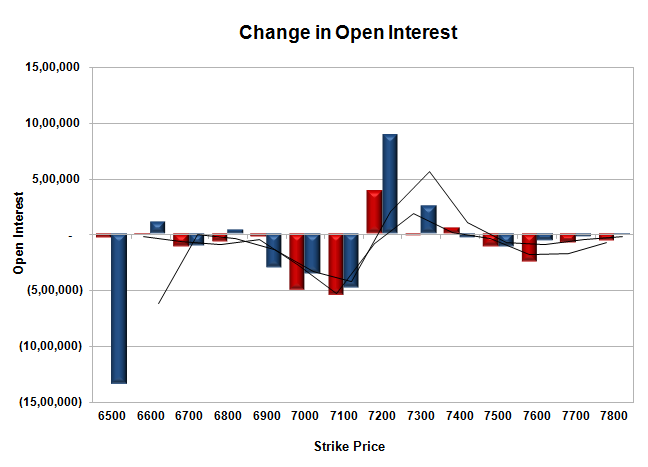 Initial strong resistance at 7300, with OI of 58.45 lacs and above that at 7400 with highest OI of 60.52 lacs. Day Range as per Option Table is 7100 - 7299 and as per VIX is 7132 - 7290 with 7195 as the Pivot. The index opened strong and stayed positive for the entire period of trade with the only dip around 7127 bought with ease and closed strong at 7191.75, huge gain of 83.30 points. The broader market was positive with 929 advances to 603 declines. The range till expiry is now at 6900-7400. Call option 7300-7500 added huge 10.75 lacs OI with short covering seen at 7200 and below strike prices. Put option 7200-7100 added huge 14.07 lacs OI with profit booking seen at 7000 and below strike prices. 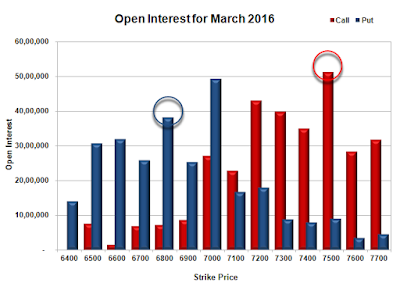 Nifty Open Interest is at 2,16,26,925 up by 5,24,325, whereas Mar series also added 7.41 lacs with increase in price, most probably long build-up in both series. Bank Nifty Open Interest is at 24,39,600 up by 1,51,920, whereas Mar series also added 0.16 lacs with increase in price, most probably long build-up in both series. 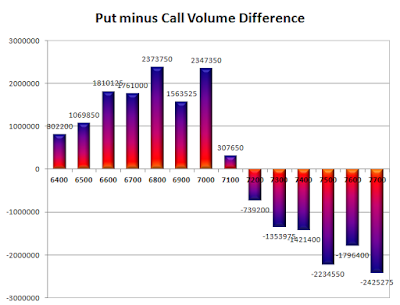 FII’s bought 2.12 lacs Futures, which includes net 26788 contracts long build-up and 18301 contracts short build-up, with increase in net OI by 45089 contracts, includes 69119 longs to 60632 shorts for the day. 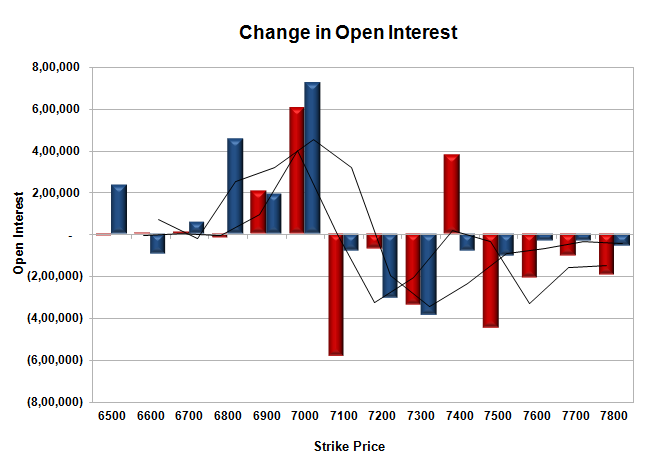 FII’s Index future open contract as on date is 182670 Longs to 153529 Shorts, Net 29141 up by 8487 contracts. Initial support at 7100, with OI of 50.07 lacs and below that at 7000 with OI of 57.21 lacs. 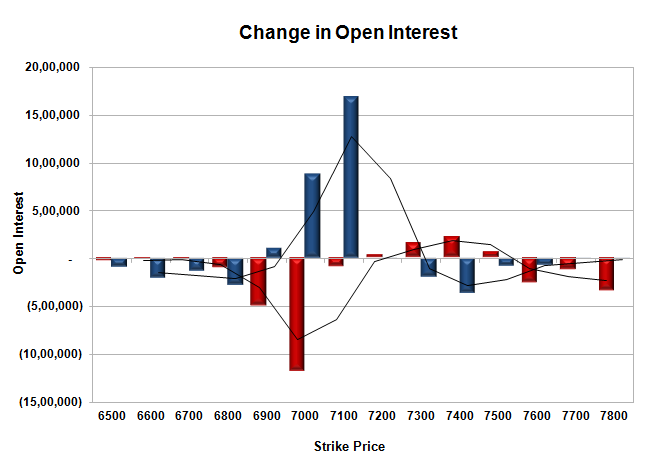 Initial resistance at 7200, with OI of 41.03 lacs and above that at 7300 with OI of 58.55 lacs. 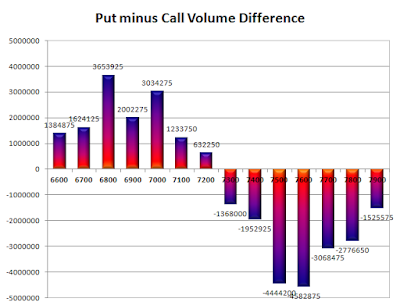 Day Range as per Option Table is 7076 - 7289 and as per VIX is 7111 - 7273 with 7178 as the Pivot. The index opened positive but selling pressure saw the index nosedive towards 6960, where value buying saw the index back in green and a strong close above 7100 at 7108.45, gain of 60.20 points. The broader market though was negative with 696 advances to 857 declines. The range till expiry is now at 6800-7400. Call option 6900-7000, 7400 added huge 11.91 lacs OI with short covering seen at 7100 and above strike prices. 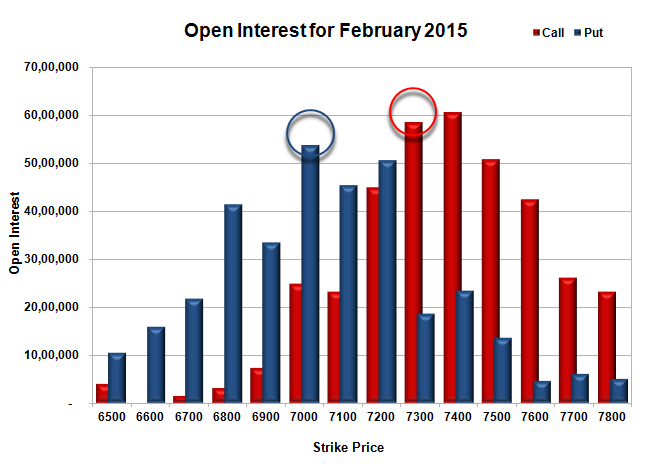 Put option 7000-6500 added huge 15.71 lacs OI with short covering seen at 7200 and above strike prices. Nifty Open Interest is at 2,11,02,600 down by 84,150, whereas Mar series added 3.34 lacs with increase in price, 100% roll-over with huge long build-up. Bank Nifty Open Interest is at 22,87,680 down by 51,750, whereas Mar series added 0.32 lacs with increase in price, mostly roll-over with small short covering. FII’s sold 0.93 lacs Futures, which includes net 5465 contracts long build-up and 9191 contracts short build-up, with increase in net OI by 14656 contracts, includes 44928 longs to 48654 shorts for the day. FII’s Index future open contract as on date is 155882 Longs to 135228 Shorts, Net 20654 down by 3726 contracts. 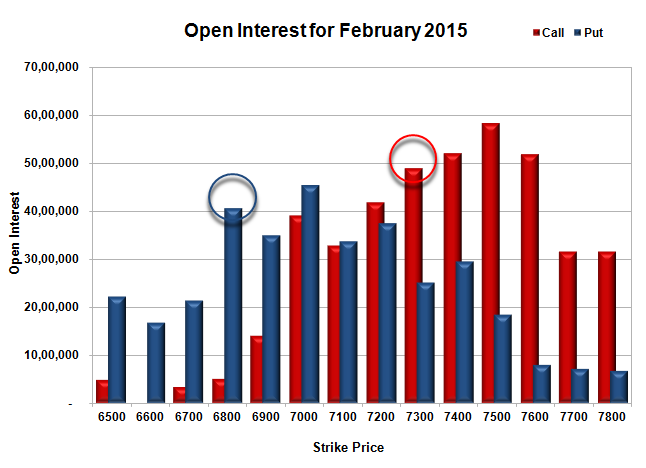 Initial support at 7100, with OI of 45.26 lacs and below that at 7000 with highest OI of 60.60 lacs. Initial resistance at 7200, with OI of 49.95 lacs and above that at 7300 with OI of 51.43 lacs. 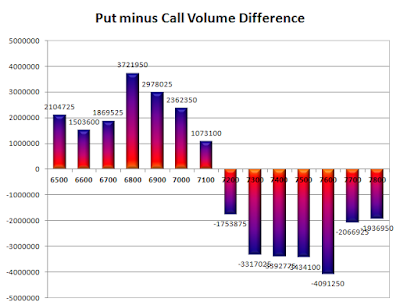 Day Range as per Option Table is 6965 - 7188 and as per VIX is 7027 - 7190 with 7064 as the Pivot. The index opened strong above 7200 but saw huge selling pressure from the onset to close weak near the lows of the day at 7048.25, huge loss of 114.70 points. The broader market was weak with 273 advances to 1290 declines. The range till expiry now comes to 6800-7300. 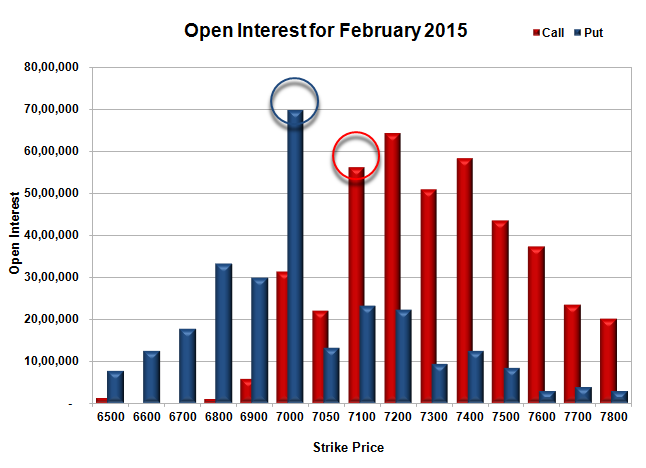 Call option 7000-7300 added huge 28.84 lacs OI with profit booking seen at 7400 and above strike prices. 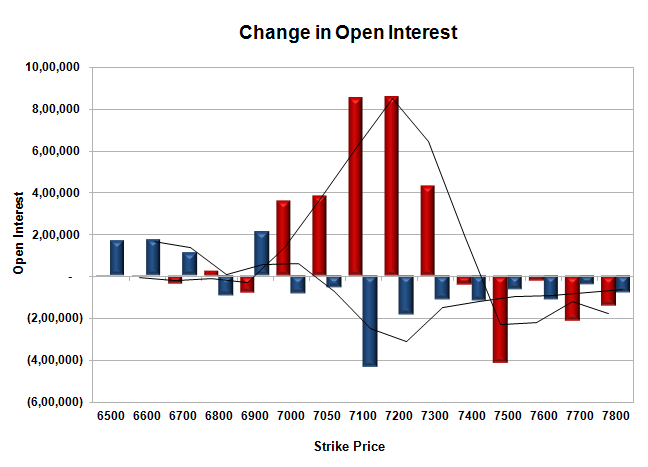 Put option 6900-6500 added 5.69 lacs OI with short covering seen at 7100 and above strike prices. Nifty Open Interest is at 2,11,86,750 up by 7,62,300, with decrease in price, most probably huge short build-up. 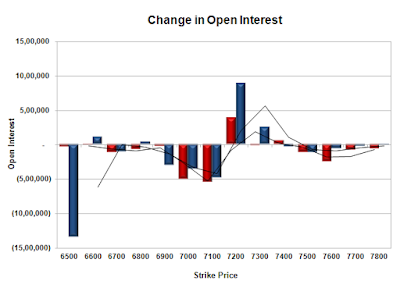 Bank Nifty Open Interest is at 23,39,430 no change from previous, with decrease in price. 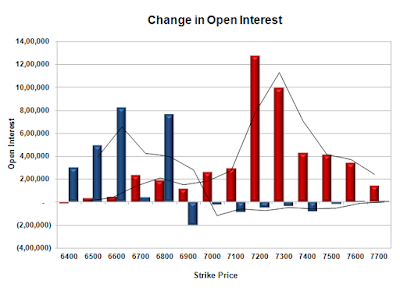 FII’s bought 4.72 lacs Futures, which includes net 18523 contracts long build-up and 342 contracts short covering, with increase in net OI by 18181 contracts, includes 54812 longs to 35947 shorts for the day. 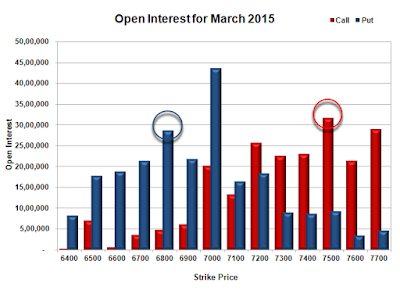 FII’s Index future open contract as on date is 150417 Longs to 126037 Shorts, Net 24380 up by 18865 contracts. 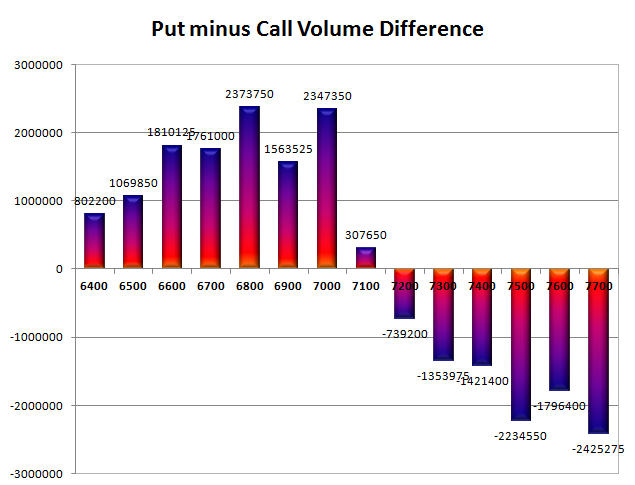 Initial and best support at 7000, with OI of 53.39 lacs and below that at 6900 with OI of 38.19 lacs. 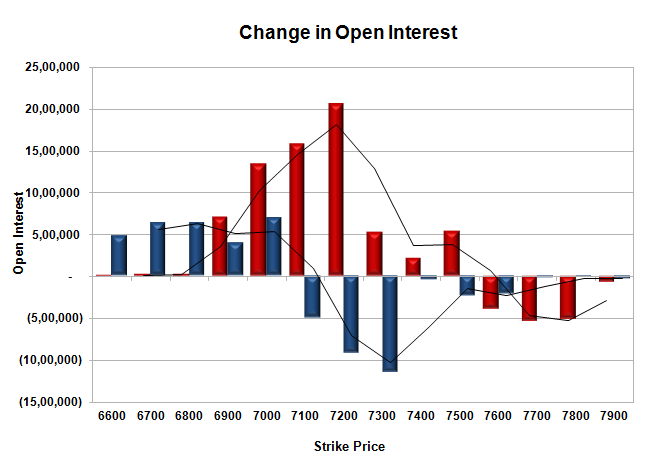 Initial resistance at 7100, with OI of 40.36 lacs and above that at 7200 with OI of 50.63 lacs. 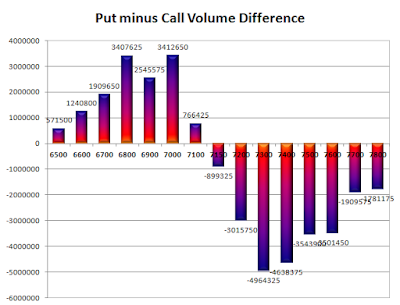 Day Range as per Option Table is 6976 - 7194 and as per VIX is 6963 - 7133 with 7097 as the Pivot. The index opened strong around 7057 and saw huge short covering rally to close near the highs of the day at 7162.95, huge gain of 182.00 points. The broader market was strong with 1331 advances to 237 declines. The range stays at 6800-7500. Call option 7200-7500 added 4.83 lacs OI with short covering seen at 7000 and below strike prices. Put option 7100-6900 added huge 26.71 lacs OI with profit booking seen at 6800 and below strike prices. 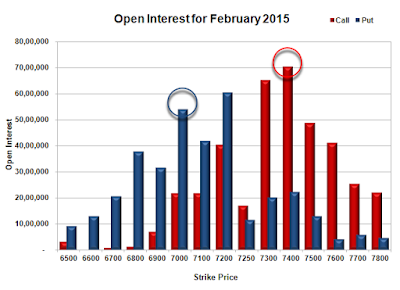 Nifty Open Interest is at 2,04,24,450 down by 4,01,625, with increase in price, most probably huge short covering. 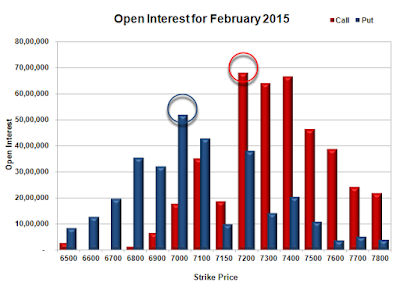 Bank Nifty Open Interest is at 23,39,430 down by 3,33,690, with increase in price, most probably huge short covering. 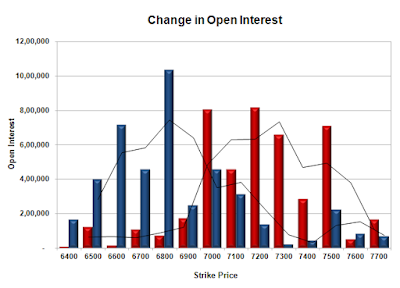 FII’s bought 4.43 lacs Futures, which includes net 11036 contracts long build-up and 6694 contracts short covering, with increase in net OI by 4342 contracts, includes 65947 longs to 48217 shorts for the day. FII’s Index future open contract as on date is 131894 Longs to 126379 Shorts, 5515 up by 17730 contracts. Initial support at 7100, with OI of 50.43 lacs and below that at 7000 with OI of 54.23 lacs. 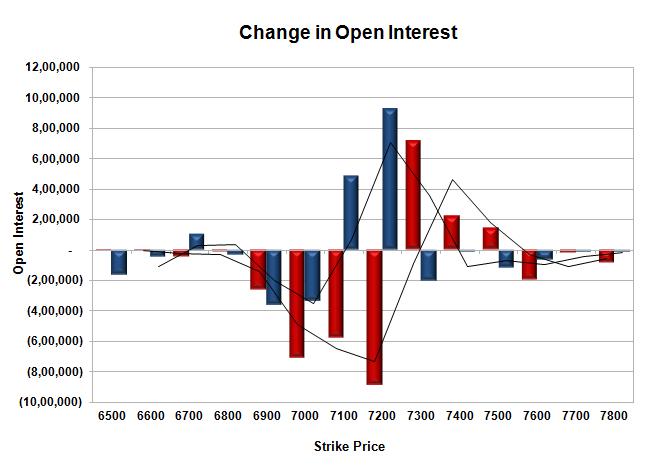 Initial resistance at 7200, with OI of 42.07 lacs and above that at 7300 with OI of 50.48 lacs. 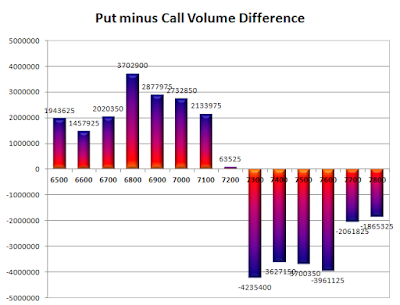 Day Range as per Option Table is 7034 - 7250 and as per VIX is 7079 - 7247 with 7134 as the Pivot. The index opened positive above 7000 but saw huge sell-off to the lows of the day at 6869, value buying around the lows saw the index back in green but closed just below 7000 at 6980.95, small gain of 4.60 points. The broader market was negative with 493 advances to 1076 declines. The range stays at 6800-7500. 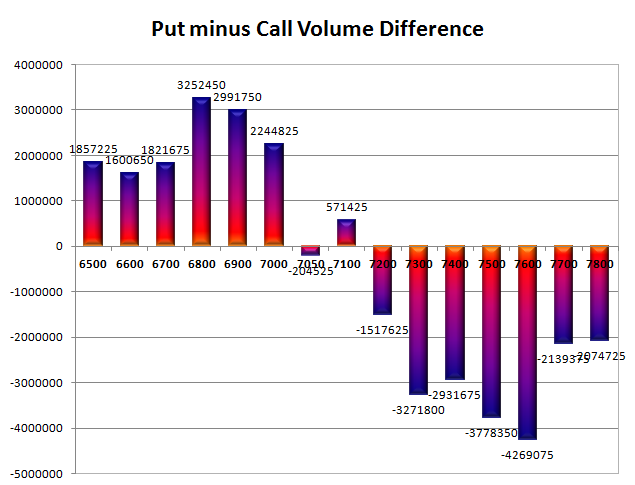 Call option 6700-7300 added huge 47.49 lacs OI with profit booking seen at 7400 and above strike prices. Put option 6900-6500 added huge 19.40 lacs OI with short covering seen at 7000 and above strike prices. Nifty Open Interest is at 2,08,26,075 up by 10,71,825, with no change in price, most probably huge long/short build-up. Bank Nifty Open Interest is at 26,73,120 down by 1,54,830, with decrease in price, most probably huge long liquidation. 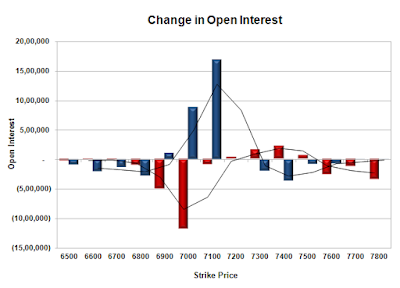 FII’s bought 3.91 lacs Futures, which includes net 15116 contracts long build-up and 519 contracts short covering, with increase in net OI by 14597 contracts, includes 67130 longs to 51495 shorts for the day. FII’s Index future open contract as on date is 120858 Longs to 133073 Shorts, Net (-)12215 up by 15635 contracts. Initial and best support still at 7000, with OI of 45.45 lacs and below that at 6800 with OI of 40.56 lacs. 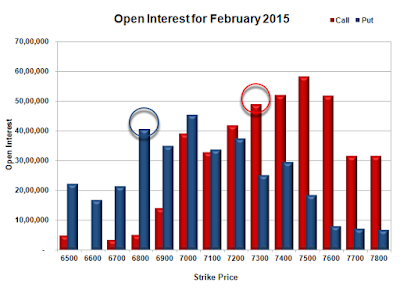 Initial resistance at 7000, with huge OI addition of 17.00 lacs and above that at 7200 with OI of 41.77 lacs. 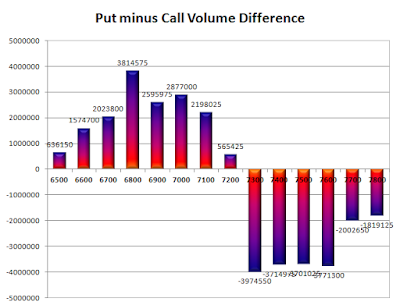 Day Range as per Option Table is 6866 - 7069 and as per VIX is 6891 - 7071 with 6962 as the Pivot. The index opened flat to weak around 7203 and stayed weak closing below one psychological level after another to close below 7000 for the first time in 22 months at 6976.35, huge loss of 239.35 points. The broader market was very weak with 121 advances to 1478 declines. The range has moved down again now to 6800-7500. 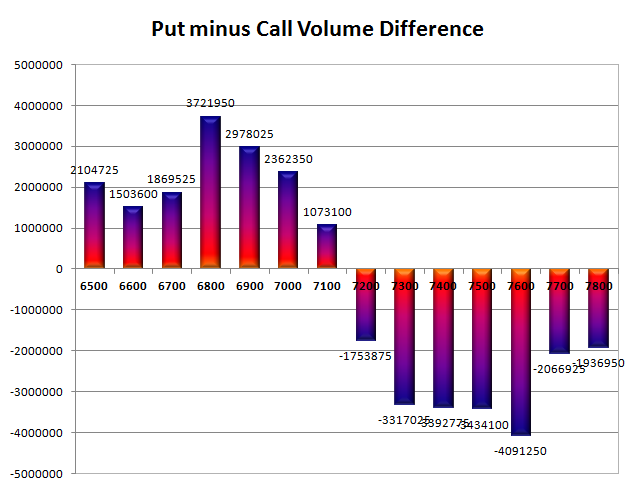 Call option 6900-7500 added huge 69.66 lacs OI with profit booking seen at 7600 and above strike prices. 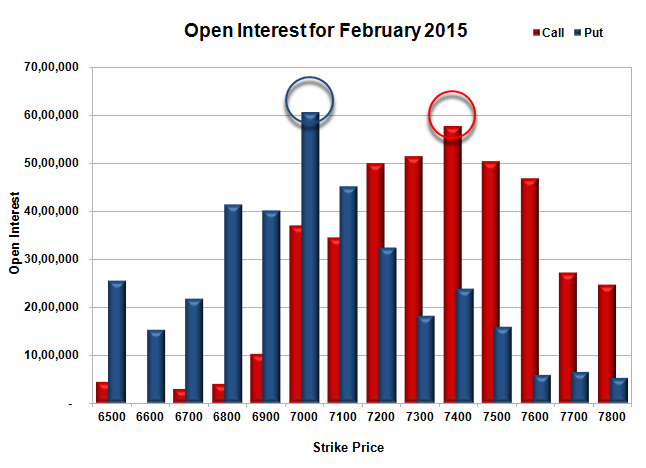 Put option 7000-6600 added huge 28.43 lacs OI with short covering seen at 7100 and above strike prices. 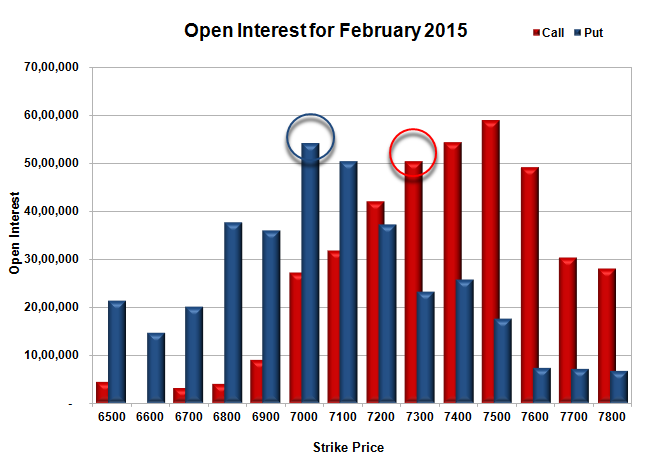 Nifty Open Interest is at 1,97,54,250 up by 10,90,875, with decrease in price, most probably huge short build-up. Bank Nifty Open Interest is at 28,27,950 up by 59,460, with decrease in price, most probably huge short build-up. 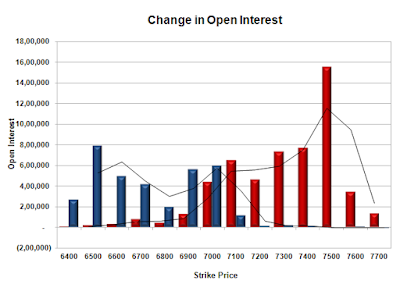 FII’s bought 2.14 lacs Futures, which includes net 10432 contracts long build-up and 1867 contracts short build-up, with increase in net OI by 12299 contracts, includes 66405 longs to 57840 shorts for the day. FII’s Index future open contract as on date is 105742 Longs to 133592 Shorts, Net (-)27850 up by 8565 contracts. 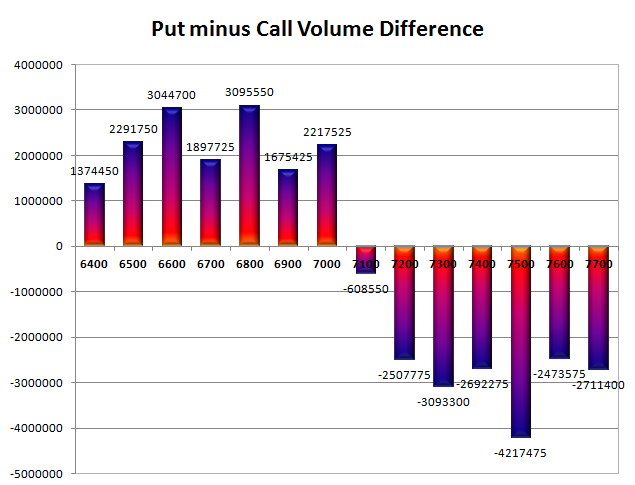 Initial and best support at 7000, with OI of 52.46 lacs and below that at 6800 with OI of 39.36 lacs. 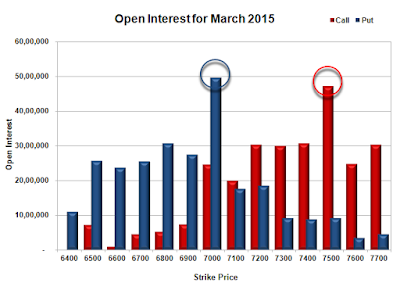 Initial resistance at 7100, with huge OI addition of 15.75 lacs and above that at 7200 with OI of 34.87 lacs. Day Range as per Option Table is 6933 - 7130 and as per VIX is 6882 - 7071 with 7048 as the Pivot.